Not sure if this is a bug or a setting I accidentally hit but during the day yesterday my watch froze and when it returned to normal, all of my messages now come through as phone numbers instead of the actual contacts name. 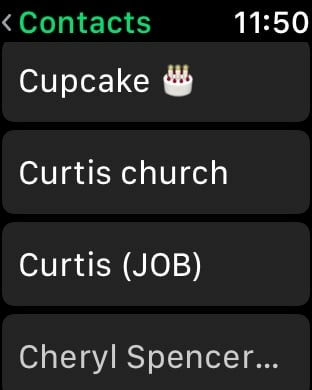 I updated to the new watchOS, restarted my phone several times, none of which helped. Any thoughts or ideas as how to fix this? Has this ever happened to anyone else? Yes, and it’s usually an easy fix. Are you on the iOS Beta by chance? It seems it's a bug occurring as a result of that. I, too, am dealing with this issue. Resetting sync data didn't resolve it for me. This phone# bug on the latest Apple Watch OS update seems to only be effecting some and not all users. I personally didn't do anything out of the ordinary during the update installation, and my contacts are showing up as names. I'm not sure whats causing this problem with some Apple Watches and iPhones, but I would try re-syncing and/or the dreaded unpair and re-pair. Cupcake? Ah, now you gotta know you opened yourself up to endless teasing for this one. Annie_8plus, Spencerdl and Just_Me_D like this. Spencerdl, Sherry_B and Annie_8plus like this. Sherry_B and Just_Me_D like this. Just updated to the latest watch os last night and I'm also in IOS 12 beta and I'm having the contacts sync issue. With all the feedback that's been submitted, I'd like to assume it's being addressed. Yes sir. Feedback has been submitted to Apple about it. Just_Me_D, Spencerdl and Annie_8plus like this. How do I set icloud as a unit on my Windows computer?